With the coldest months of the year just ahead, we could use all the excitement we can get—and sequins are giving us that much-needed dose of sparkle. These tiny embellishments may bring the dance floor to mind, but their jovial invasion into daytime attire has made it easier than ever to find elevated pieces that demand a double take. On-trend sequins are ready to shine on everything from dresses to boots, in striking and subtle ways. If you’re up for some fun, here are two stylish ways to work them into your look. Don’t reserve your boldest sparkle for New Year’s Eve. 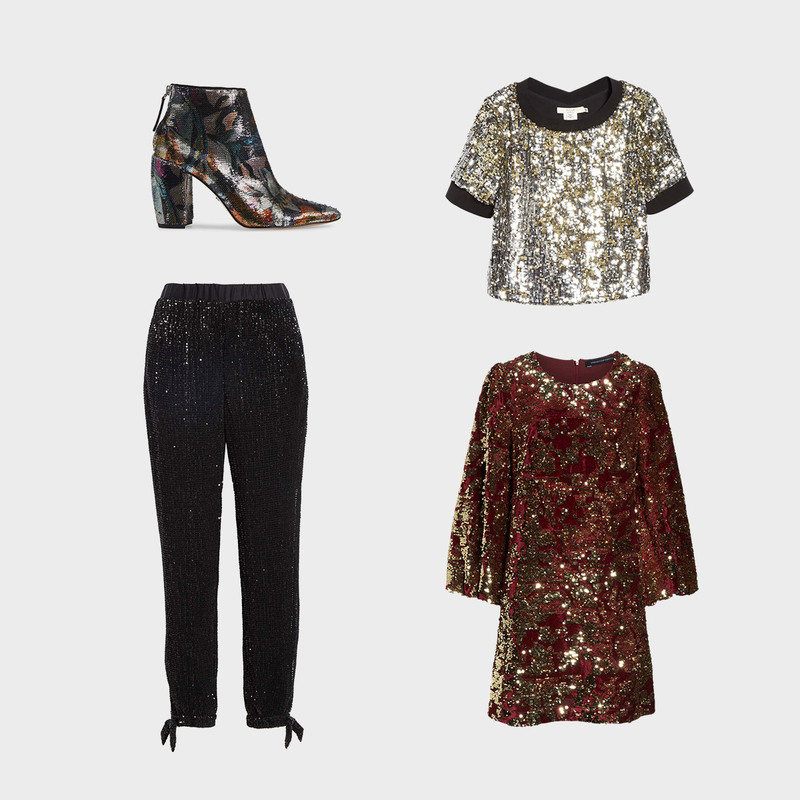 A heavy dose of sequins can transform an outfit into a total showstopper. Tonal ones, like black on black, look especially modern on a pair of dressy joggers. To add a bit of drama to an LBD, try a printed boot. The trick is to shimmer and shine while avoiding a costume look, so stick to metallics and darker tones to balance the flashiness of the all-over effect. If you’re not ready to dive into a sparkle pile just yet, try a toned-down version of this trend. When sprinkled onto other fabrics, sequins add whimsy and elegance without bringing the full party. A dusting across a chunky knit sweater makes for a dreamy separate to pair with a classic bottom, like black skinny jeans. For evening, be on the lookout for glimmery pieces like a lace skirt or a classic pump.